Clear is the new black. The jacket is super awesome and a lot of fun. 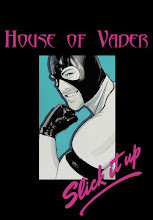 Pick it up at Slick It Up at a discount using coupon code HOUSEOFVADER . Photo by Marco Ovando.